Happy (almost) New Year to you and yours. How has your 2011 been? For me, it has been an eventful, active, crazy and stressful year. We have been settling into our new city, trying to buy a home (a painful process that has lasted seven months so far), spending time with friends, old and new, and being with family much more now since we are closer in proximity. It was especially nice this year too to become more involved with extended family, and being so welcomed by them to join for holiday gatherings and other festivities. I also turned the big 4-0 this year. Ugh. That was a tough adjustment for me. I am still not so sure I believe that I am forty. The most unfortunate and painful part of this past year for me is that I put on a whopping 30 pounds of unnecessary weight. My mother is likely cringing when she reads this. Its nuts. I know. I weigh more now than I did when I delivered Sarah. It's hard to believe, but the pounds just piled on while I was trying to get adjusted to a new way of doing things living in the suburbs especially since we have to drive mostly everywhere, versus walking, to get to where we want and need to go. It was also challenging to carve out time to workout at home as Sarah always got under my feet when I popped in a fitness DVD. I also joined a gym that was difficult for me to get to since we have been a "one-car family" living in the suburbs. The latter is going to change in 2012 once we buy and settle into a new home. We fully intend to get another car. There are really no good excuses for my weight to get this out of control. However, moving to a new home, starting a new school for Sarah, not seeing my NY/NJ friends as much as I used to when we lived near New York City, trying to make new friends all around, and acclimating to a new job that I have now been in for over a year learning a great deal and flexing some new muscles (loving social media), has been a full plate indeed. Now that we are settled and striving in our new jobs, enjoying new relationships with friends for Daniel, Sarah and I, and adjusting well to our new neighborhood, surroundings and local activities, it's time to take matters into my own hands and float only a few plates in the air at a time, if possible, versus the many that were in the air in 2011. Thankfully, Daniel is doing great and Sarah is thriving and growing at an exponential pace. Both of them are the light in my life and this year I feel even stronger and more connected to them. So, as much as I have tried to take the weight off this year and make a dent, I have not. I have decided to make a resolution, something I don't often do, and hope to G-d that I can stick to it. I don't like how I feel in this body. And, my former clothes certainly miss being worn. I have also been more self-deprecating about my body including in front of Sarah, and realize that this behavior has to stop. I don't want Sarah to become self-conscious in any way or become insecure about her looks or body type. While this year will center much around my daughter and husband, as they are an integral part of my life, I look forward to finding more much-needed time for me especially for working out and eating better. This is not just for me. 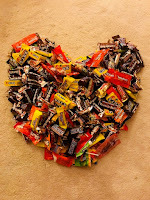 This is for Sarah and for Daniel. As I get older my health is that much more important. Getting back on track is one of many goals for me for 2012, but a significant one I aim to achieve and maintain. Wish me luck. I know what I need to do as I have done the weight loss successfully in the past. It's that I need to stick to it, and stick to it hard. For example, before getting pregnant with Sarah, I wanted to start at a certain, healthy weight. By achieving that goal I felt in control during my pregnancy and gained only the required weight. After putting on weight while breastfeeding, as I felt ravenous all the time, I managed to get on track and lose nearly 20 pounds. I know I can do this. I just need to do IT. What are your goals for 2012? What do you aim to achieve this year? Let's toast to a new year of life, love, happiness, and good health. We received a really great holiday gift this year, and I wanted to share it with you here since it may be something you would like to get for your family, for free, as well. Last year I wrote on my blog about an organization called The PJ Library (post available here), which happens to offer awesome reading and Jewish education materials that include sending books and music once a month to families in various cities around the United States and Canada, centered on Jewish culture. The story of how The PJ Library came about is a beautiful story, and it's included as well in my previous post. This month, for example, we received a book about the Hanukkah holiday. When we received a letter a few days ago acknowledging the books and music they sent to us this past year they also happened to mention that they are gifting us with another year of wonderfully, valuable reads and songs. I yelped with excitement so pleased with this opportunity to continue to expose Sarah to their quality tools to provide entertainment and education simultaneously about Jewish culture that she has enjoyed to date. One request the letter stated what that I share the opportunity, with others, you my readers, and friends and family, the chance to join PJ Library, at no cost, and become a recipient of these valuable materials to share with your children. We have been so fortunate to be on the receiving end of this great gift, and on this holiday week, we wanted to share it with you as well. Enjoy this great reading and learning opportunity. You can enroll online, renew an existing subscription and also sign up to donate subscriptions to families who are not in a PJ Library community to give back to this great cause. Happy reading in your jammies. Have fun!!! Happy Holidays!!! I wanted to take this time to wish all of you who celebrate Christmas, a wonderful holiday. Here are some special Haiku for this special time. A special holiday wish to you and yours from Mommy's Point of View. What are some of your family's holiday traditions? 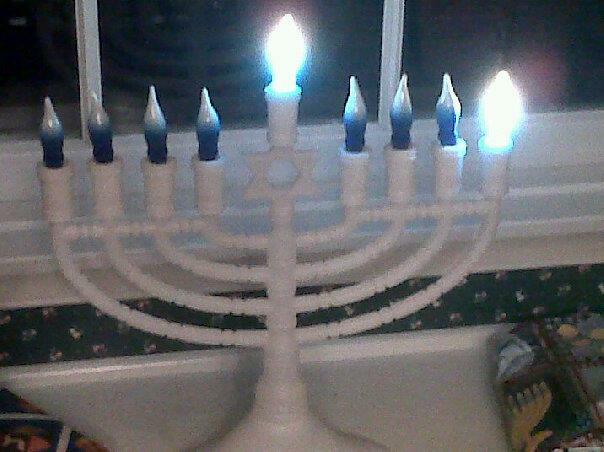 Tonight, the fourth night of Hanukkah, Sarah blew my mind. We were getting ready to light the electric menorah candles for the holiday and Daniel and I heard her whispering under her breath the first Hebrew prayer for the lighting. At first, we thought maybe she was just making up words. But, then as we listened more closely to her, she was actually saying it. Sarah started with the first few words and we thought that would be it. Then, she proceeded to recite the entire verse word for word. She said the prayer, which phonetically is Baruch atah Adonai, Eloheinu Melech Ha-Olam asher kideshanu b'mitzvotav, vitzivanu lehadlik ner shel Hanukkah. Daniel and I stood there listening to Sarah with our jaws dropped and excitement in our eyes. I was jumping up and down too and we were applauding her for this amazing feat. I don't think Sarah even realized how awesome this accomplishment was. What's even more incredible about this is that Daniel and I have not sat down with her to go through the prayer word for word because she's only nearly four years old. As we continued to light our additional menorahs, the next one with actual candles and flames, and another two, pretend menorahs, one with Velcro-backed candles and one with rubber candles, it occurred to me that Sarah learned the prayer by repetition. 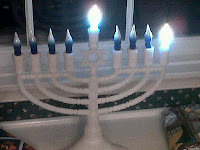 With this many menorahs, we were saying the blessing at least four times each night for the first half of the holiday. Sarah actually caught on to what Daniel and I were reciting each time we lit, and pretend lit, the candles together. It just proves that children do learn by example and repetition. And, while I know that Sarah is a sponge and processes her information very quickly this experience with her tonight was an incredibly proud moment watching my little girl growing up. Of course, for a moment, I thought, what it will be like when she's 12 years old and receiving her Bat Mitzvah and the feeling of being a proud parent and one of Sarah's biggest fans. Children do learn by osmosis. It's important for us as parents to communicate with our children directly and use proper adult language and vocabulary, whether it be English, Hebrew, ASL, or any other language. Children do learn by watching and listening to us and we are their models for learning. This proud moment has been brought to you by Mommy's Point of View. And, because I often feel that Haiku is an excellent way to sum up what I am thinking and feeling into as few words as possible here are a few poems to showcase this wonderful experience. What's a proud parenting moment you have experienced recently? With the holidays in full bloom and presents being bought, wrapped, and given to family and friends, one gift that sometimes gets forgotten is the one to those in need. Especially with this rocky economy and people we know, and don't know, are out of work, it can be a tough time of year, especially for children who are without the sparkle, shine and glimmer of gifts. The same holds true for adults who are without as well and struggling to make ends meat and to put smiles on their kids faces with presents for them to open. This week I wrote a blog post to kick off the Hanukkah holiday here and how it is a reminder of the blessings in our lives and not just the presents that we give and receive. I don't know why this year should be any different than past Hanukkah's, but this one opened my eyes even more than before to understanding the meaning of Tzedakah -- the gift of giving. It's very possible that as I teach Sarah about her religion and help her to understand as she grows, I have become more aware, in tune and sensitive to what matters most and helping to pass on these traditions and teach her valuable lessons that she will witness and act on in the future. I was raised to be kind and mindful of others and to give where possible to help others in need. Therefore, it became natural for me as a young adult to volunteer my time and efforts at hospitals, kid-specific education activities and fundraising for health care causes near and dear to my heart. Interestingly, it just so happens that reaching out to those in need is central to being Jewish as well. It seems that I was born into this way of being and fully intend to pave the way for Sarah as we share in this process together of helping others where possible. Today I rummaged through clothes, toys, books, and shoes and managed to pack up five garbage bags full. I then dropped them off and donated them to Good Will. As much as it would be nice to sell these items via consignment, yard sales and other similar events, to make some money, it seemed brainless to me at this time of year to think otherwise. What made this gift giving even more special was the incredible appreciation and respect of the staff receiving this donation for their patrons. Good Will is one of many types of organizations to donate used belongings to help others. Consider local thrift shops, hospitals and houses of worship who often value these items to share with those in need. There are so many people without this year. If we are able to give of our time, money or even old clothes and other belongings let's please consider what we can do to impact the lives of others including families with children who are without. What do you like to do to give back and help others? Did you like this post? Please stumble it, share it on Facebook, Twitter and more. 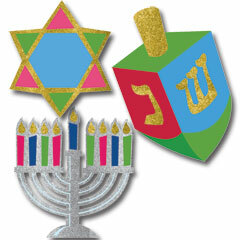 Tonight is the first night of Hanukkah, the celebration of the festival of lights in Jewish tradition. With Sarah approaching the age of four it felt different this year for me to make more of a fuss about Hanukkah than what I was used to doing when growing up. It was my mission to help her see the beauty of this holiday, begin to learn more about its history, and to start to appreciate its traditions, especially those that we create together as a family. Interestingly, today Sarah asked me if we were going to be putting up Hanukkah decorations inside or outside of our house. She likely asked this question because many people, including friends, relatives and neighbors have their homes emblazoned with colorful lights for all to see with Christmas in close proximity. 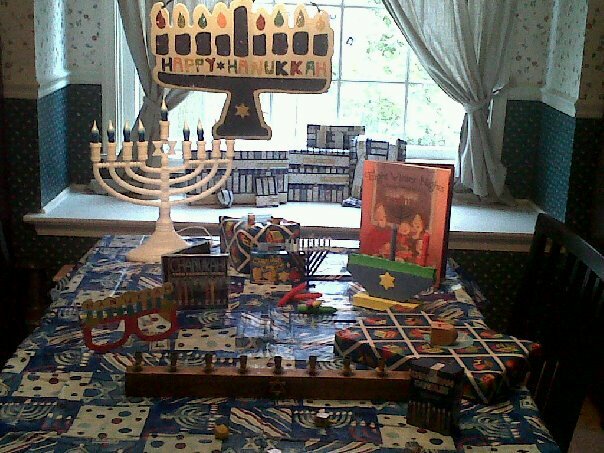 In years past, especially before Sarah was born, the only sign of Hanukkah in my home was the symbolic menorah (both electric and the one with actual candles for lighting). Otherwise, I rarely if ever hung up decorations as that was not what I experienced growing up as a kid, and not something typical in Jewish tradition. It just so happens that while Hanukkah is an important holiday with much significance in Jewish culture, it is not the most important Jewish holiday of the year. Yet, Hanukkah has changed somewhat over the years mostly because of its timing being so close to Christmas. As parents, it's our job to help guide our children, especially as far as religious and spiritual beliefs go. Therefore, when Hanukkah comes around, especially as Sarah starts to gain a better understanding of this holiday, it seems as if more needs to be done on my part, and Daniel's, to help her see its value, especially beyond the gifts and glamour. I admit that this year I went overboard a bit on presents, and plan to institute a budget cap next year. 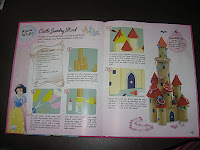 It's so easy to get lost in the desire to want to provide our children with wonderful new toys and books and fun stuff. However, one of the biggest lessons around Hanukkah, and Jewish culture, is that it is less about receiving gifts but instead about giving to help others in need. This is called Tzedakah. Sarah and I have both shared our belongings in the past to help others. That's why tonight, I told her that tomorrow we will go through some of her old clothes, toys, books and more and pack them up to share up with other children who are less fortunate. She agreed, and with a smile. I will be doing the same of my things, and plan to begin the purge tomorrow. On another note, this year, while shopping for presents I started to notice that stores were including a robust supply of Hanukkah decorations. It was really nice to see and it made me smile. I was tempted, and decided to begin a collection of items to pass on to Sarah in the future. I stocked up on beautiful decorative wall hangings and paper lanterns with stars and dreidels, among other things. Hanukkah is indeed a celebration and one that deserves some decorative elements to add to the festivities. Today, I decided to surprise Sarah with all the decorations set up in our dining room. After doing this I got an awesome feeling of wanting to invite everyone we knew to come over to celebrate in the joy of the freedom we have been given to live and choose for ourselves thanks to the Macabees for their sacrifices and risk taking efforts to help the Jews. So, as the lights burn over these eight days and nights, dreidels spin, fried food gets eaten, and time is spent with loved ones, let's be reminded of the efforts made in our history to create the freedom we now experience today. And, let's celebrate with the lights of the candles as they flicker and be reminded of what has been done for us, and what we need to do moving forward to help others. Last year, I wrote a blog post about Hanukkah including several haiku poems to celebrate this wonderful time of year. Enjoy! I also decided, with new perspective, to write new Haiku this year. These come from an even greater understanding of this holiday especially as a parent and educator to my child on her future Jewish learnings. There are many great things that kids can do with recyclable products and turn them into masterpieces. Recently, Sarah and I found inspiration in a book that Daniel found at the Christmas Tree Shop in our neighborhood. 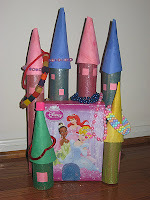 The book entitled Disney Princess: Things to Make and Do, Dress Up-Fashion included a Castle Jewelry Stand made out of common household leftovers including toilet and paper towel rolls as well as boxes and paper. And, this unique craft is a great way for girls to hold their rings, bracelets and necklaces. 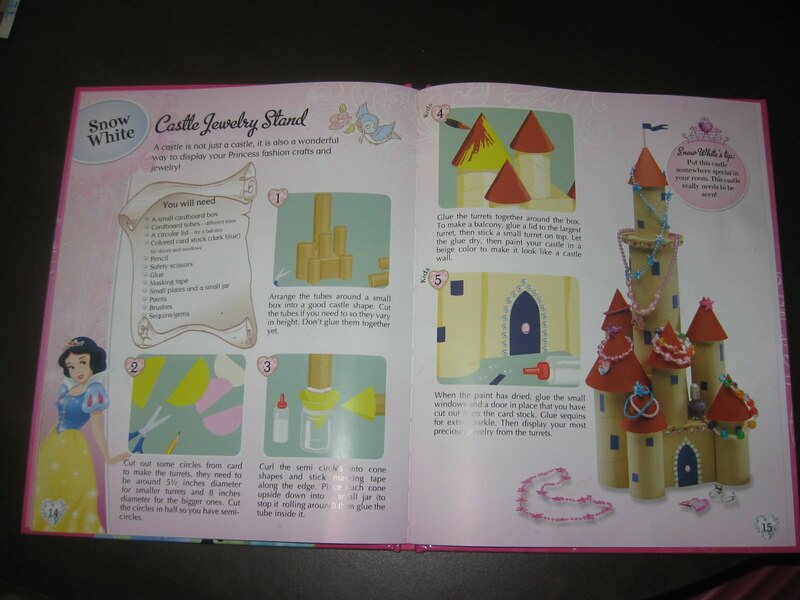 As you can see from the picture of our final product on the left versus the model in the book, we found the inspiration yet chose to create something a bit different based on the supplies we did have at home. As a result, our creation is a bit more gussied up and unique. I also felt that the way we chose to do it enabled Sarah to be more involved in the creation. 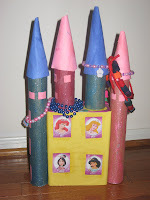 For example, we chose to color the rolls with glitter paints that Sarah easily could do on her own. That's the beauty of creation. Sometimes you just need something to inspire you and then you can take it in a somewhat different or modified direction to suit your interests and supplies. Since we didn't have a small brown box but instead shoe boxes, I asked Sarah if we could use one she had that happened to have her favorite princesses on it. It was the perfect compliment. The nice thing about the shoe box too was that it included four pictures of princesses on the sides. 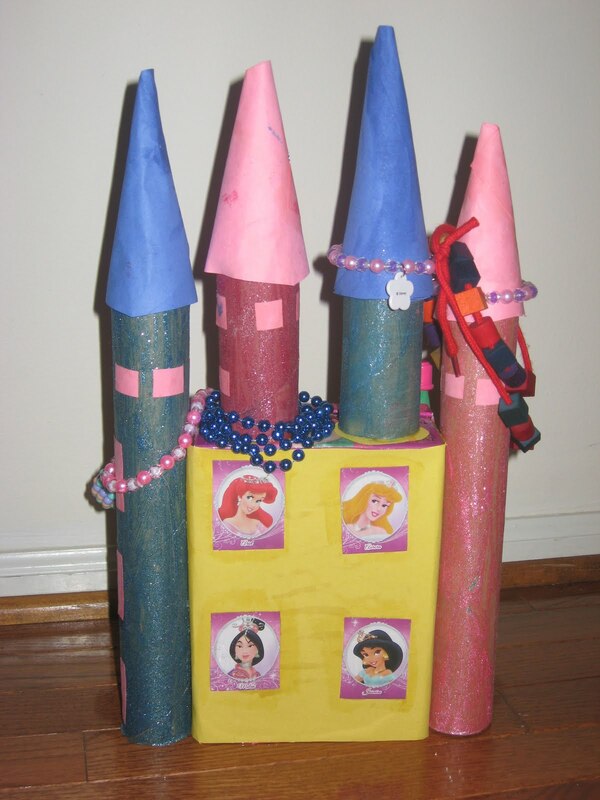 So, after covering the bottom of the box with colored paper, which was the only plain part of the box, we then cut out the pictures and decorated the back of the castle to embellish it further. After all was complete we dazzled it with Sarah's jewelry and her eyes lit up. She was so proud of this creation we did together. As a result, we have become more conscientious of the recyclable goods we have at home and do our best to store them away for future arts and crafts projects. Give it a try and see what inspires you to create. I am truly a lucky woman. And, Sarah is a lucky kid. Not only did I marry a wonderful man who is also my best friend, but he also happens to be a super great dad too. 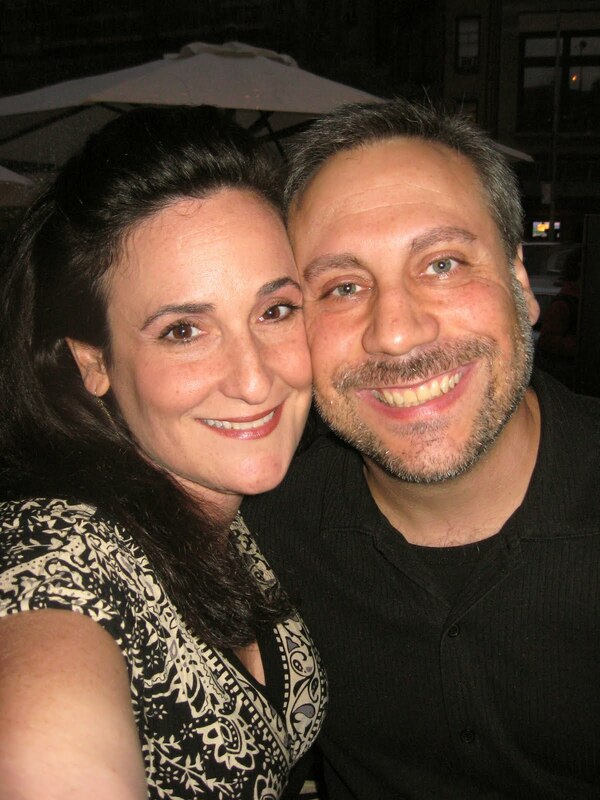 Since we have been together over nine years, Daniel and I have become a well-oiled machine. It took time for us to really get to know each other over the years, learning, understanding and appreciating our quirks and idiosyncrasies, seeing how each of us is as individuals and developing together like a fine wine aspires to be. The same holds true for parenting. It sometimes has become an unspoken language between us where if one of us does one task the other person takes on another responsibility to help. I feel it is important, and Daniel agrees, that Sarah needs to know and see that both mommy and daddy can make dinner, do the dishes, give baths, take out the garbage, go grocery shopping, and more, and that specific tasks are not just the responsibility of one parent or a specific gender. It's also very important to help children understand that men and women play various roles in a relationship, and especially as parents, and that we share in the tasks and responsibilities of running a household, working, and parenting together. Therefore, I really AM a lucky woman. Daniel steps in and helps and I greatly appreciate him for it. 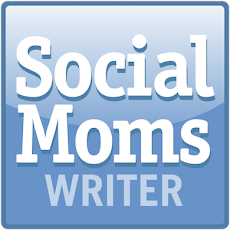 When I became a mommy, I was so convinced that I could do it all, at least relatively speaking. Over time I realized that as much as I wanted to do everything with Sarah it just wasn't possible. I needed to let some things go and let Daniel play a part too. Often times moms bond sooner with their babies, especially when breastfeeding is involved. Therefore, dads or partners have to find others way bond with their children and we have to help make that happen. So, in order for Sarah to forge a bond with her daddy it was necessary for me to give up things, even if I liked doing them, and enable Daniel to partake in some parenting duties (e.g., drop off /pick up from school) to be a special part of her life. As a result, I have gotten much better at asking for help from Daniel when I need it, realizing that I do need to share Sarah and our time. Daniel and I plan regularly to determine how we can carve out time for each of us individually, time with Sarah, and time for dates. Parenting is a tough job. And, it is really challenging for parents who don't have support or need to find support with other family and friends. I am thankful for Daniel being such a wonderful husband and father. Sarah and I are both very lucky to have him in our lives and he makes us laugh on a regular basis. I am truly blessed to have a man in my life who allows me to be me, quirky and all, who enables me to be independent too and helps me when I need it. It's these important qualities of our relationship that Sarah continues to witness so that she can learn that a loving relationship is partnership filled with respect, trust, loyalty, and lots of laughs.